This Egg Roll Soup is an easy, weeknight dinner that is full of the flavor of an egg roll, without any of the fuss of wrapping and frying! 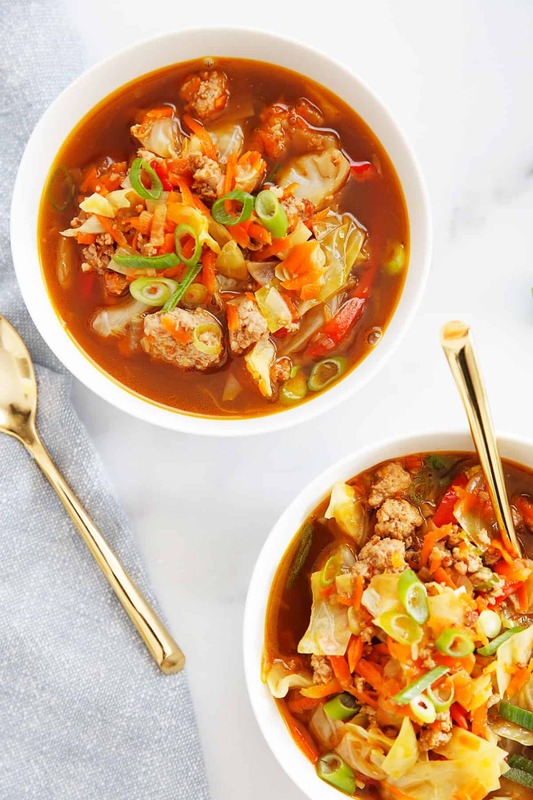 This veggie and pork soup is family friendly and would make great leftovers! We also offer options to make it vegetarian, and it’s already Paleo, Whole30 and Keto friendly too! 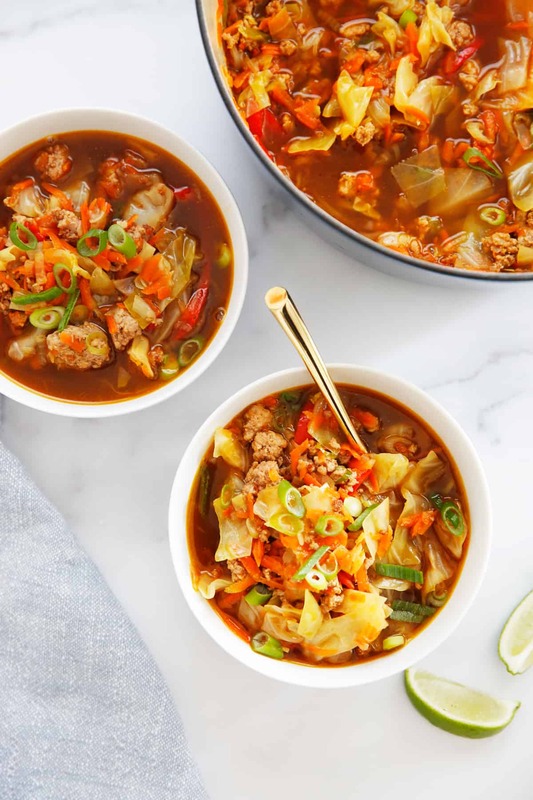 If you’re looking for a weeknight dinner win, you’ve found it with this deconstructed egg roll made into a soup! It really taste like an egg roll only it isn’t fried, which makes it an easy, cleaned up version of your favorite Chinese take-out appetizer! This low carb soup is super filling and is a family friendly dinner. The best news is you can have this on the table in about 30 minutes and everybody will be satisfied. 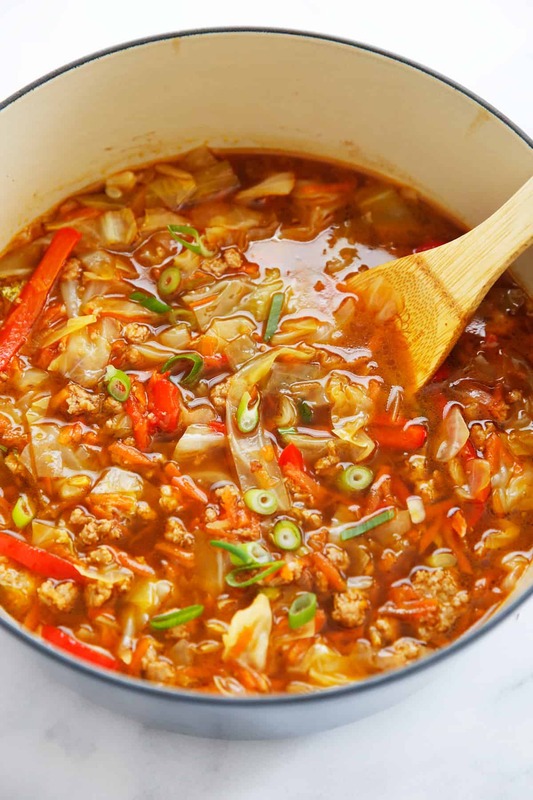 What ingredients do you need for this paleo egg roll soup? Can you make this soup ahead of time? Soups are the ultimate make ahead meal and it’s freezer-friendly! This would be a great meal prep item to make a double batch of. Freeze some to eat later, and eat some throughout the week for lunches or dinners. Heat a large pot over medium-high heat. Once hot add oil and brown pork, about 8 minutes. Lower heat to medium, add another splace of oil if the pot is dry and then add onion, red pepper, ginger and salt. Stir and cook until vegetables beginning to soften, about 5 minutes. Add the broth and water and scrape up any browned bits. Add cabbage, carrots and bring to a boil. Then reduce heat to medium and cook until the vegetables have softened, about 8 minutes. Add coconut aminos, fish sauce, rice wine vinegar and salt and pepper to taste. If you don't have rice wine vinegar, you can substitute white wine vinegar or lime juice. To make vegetarian: substitute in mushrooms for the pork, and veggie stock for the beef broth. Thanks for the recipe. Can I replace avocado oil? Made it for lunch this afternoon, could not have been pleased more!! Had to use olive oil (couldn’t find avocado oil) and used lime juice – Perfect – Already printed recipes for my daughters, and some group texts – Keep meals like this coming! What kind of mushrooms would you use for this? A few different kinds could work well here, ranging from a white button mushroom or crimini mushroom, to a shitaki or a portobello.